Home > Branding > Reviewed: NCT’s ‘big orange’! It’s launch day for the new Scanias on Nottingham City Transport’s flagship route 36, so we’ve been to have a nosey at their new toys! 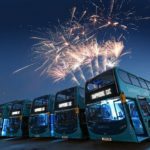 As we reported back in January, NCT has taken delivery of 40 Alexander Dennis Enviro400-bodied Scania N230UDs for several of its Go2-branded routes across the city. 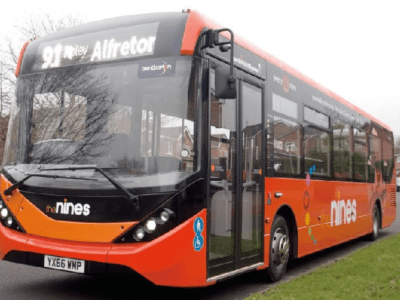 Monday 3 March saw the launch of the new vehicles on services 36 (City – Beeston – Chilwell) and 77 (City – Aspley – Strelley), in addition to those already in service on Red Line 43 – and the ones due soon for Lime Line 58. 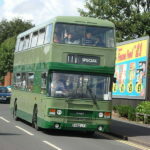 Unlike the other routes, which have enjoyed good levels of investment in recent years, Orange Line 36 had previously been a motley mash-up of ageing Scania Omnidekkas; a stark contrast to the well turned-out Mercedes Citaros of Heanor-based competitor, Yourbus. We’ve spent the day riding around on the new, improved 36 to see what’s changed. So, first impressions? Well, the new vehicles are certainly striking. 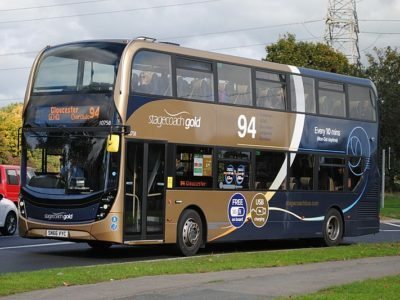 Whilst most major towns and cities of the UK are now used to the sleek, curved lines of the Enviro400, Nottingham is a city which has been little touched by anything with even half as much road presence. The bright orange and silver relief of the Go2 36 branding certainly stands out – especially in the glow of the winter sunlight. However, it’s a very different picture inside. In fact, it’s hard to believe it’s actually the same vehicle. Stepping through the doorway is like stepping through a vortex of brash colour into something altogether more tonal – and mellow. Gone are the cream walls and harsh light fittings of the outgoing Omnidekkas, replaced by a much more thought-through colour scheme of grey, green and lime. The first thing you notice when you step past the front wheel arch is the LED lighting – the seats, the handrails and the glass partition of the staircase emit an eery green glow from below. The Lazzerini e-leather seats are comfortable – with the exception of those just over the lower-deck rear wheel arches; sitting bolt upright on what can only be described as a vibrating rock is not comfortable in the least! There are some nice interior touches, from the air ventilation system (extremely noisy upstairs, but ensures that the vehicle maintains optimum temperature regardless of conditions), to the soft, calming interior roof lighting. The tinted, bonded windows perform brilliantly, and do well to block out the harsh winter afternoon rays. Altogether, it’s a very, very nice place to be. 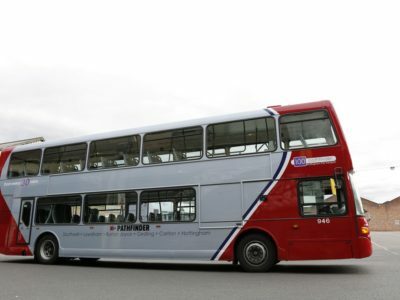 The overall build quality of the N230UD/Enviro400 is excellent, with hardly a single audible rattle – again, a massive contrast to the bone-shaking Omnidekkas of yonder. 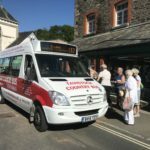 There’s plenty of space and headroom too, especially on the top deck; the 4.3 metre, full-height bodywork contrasts to the neck-bending low-height examples Stagecoach specifies. Scanias’ 230-horsepower N230UD unit reassuringly growls away in traffic, and the low-revving unit provides a good boost getting away from the stops. NCT has opted for Euro 5 nine-litre DC9 30 engines, coupled to ZF 5HP504C Ecomat fully automatic gearboxes. The downstairs saloon is incredibly noisy towards the rear; upstairs however, the engine provides a soulful backdrop to the journey. 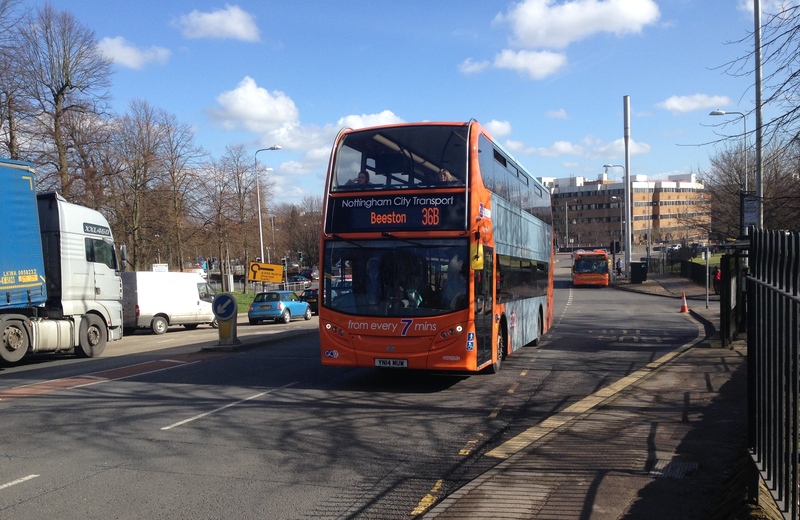 So, new vehicles all accounted for – what’s next for Nottingham’s Big Orange? 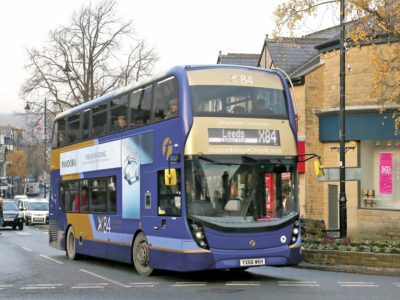 The 36 has been dogged by problems in recent years – not least in the shape of competition along the route from other operators, but also from the NET Phase Two works which cripple the service on a daily basis as they bring the west of the city to rush-hour gridlock. NCT have recently introduced a range of changes across the route to try to combat the effects of these works, including the introduction of short workings to Beeston. They’ve also worked hard to keep customers informed through social media, providing much-needed information in real-time direct from the control room. It will of course be interesting to see in which direction Nottingham City Transport decide to take their marketing of the shiny new Orange Line in light of these pressures – previous campaigns have focussed on the one thing which competitors (and indeed the incoming trams) cannot currently offer: the view from the top deck! Have you tried the new vehicles yet? We’d love to hear your thoughts. Comment below, or drop us a tweet – @transportdsn.